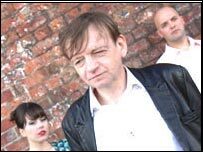 Mark E. Smith, legendary lead singer of cult band The Fall, will be appearing on BBCi's live results service Score on Saturday. Smith, a Manchester City fan, will be reading the classified football results live on air. Smith's band The Fall provided the theme tune to Score and Final Score, Theme From Sparta FC. Viewers can catch Smith's appearance on Score at 1745 GMT on BBCi - press the red button on your remote control. The Fall are known as one of the most enigmatic, idiosyncratic and chaotic garage bands of the last 30 years. The Manchester band have released more than three dozen albums since forming in 1977, and were John Peel's favourite band. Smith is the only constant in The Fall line-up, which has featured over 40 different members over the years. Score is available on BBCi and on the BBC Sport website from 1400 on a Saturday afternoon and lasts until 1800.